Waste management can be a headache for some businesses, especially those who produce any waste classified as ‘hazardous’. Staying on the right side of the law is also essential to ensure that your business is not slammed with hefty fines for incorrect disposal. This article will walk you through what waste is and how it’s classified, then the through the uk waste regulations around the following topics: storage on site and disposal, hazardous waste, food manufacturers and outlets, waste carriers and pre-treatment and waste transfer notes. So, first things first, what is waste?Waste is legally defined (more or less) as anything that has been discarded by its last user. There has been more than one court case in the UK that has attempted to push the boundaries on this definition but, for most businesses, this basic rule of thumb is a good one to start with. Businesses in the UK are slowly waking up to the importance of proper waste management. Correct treatment of waste can have a big impact on a bottom line. 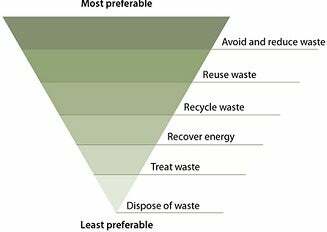 To encourage businesses to think carefully about their waste, the EU Waste Framework Directive sets out its ‘waste hierarchy’ – a set of priorities for waste management that starts with prevention as the most favourable option, and ends with landfill disposal as the most wasteful. In an ideal world one set of regulations would cover waste disposal – unfortunately the complexities of waste itself make for a much less than ideal world. The Environmental Protection Act 1990 is the main piece of legislation that is most relevant for businesses – this covers the management and disposal of ‘controlled waste’ which is defined by the act as being commercial, industrial and domestic waste. Both agricultural and mining waste are included under the commercial and industrial sections of this legislation. Safe on-site storage for all waste. Waste must be collected by a registered waste carrier. Disposal of the waste must take place at a licensed waste disposal facility. Waste must be covered by a waste transfer note. Pre-treatment – i.e. sorting recyclable and non-recyclable material – is also a duty businesses must fulfil. This can be on-site or completed by your registered waste collector at a sorting facility. Your premises must be registered as a ‘hazardous waste producer’ if it is located in England and Wales. Appropriate containers must be used for hazardous waste. Hazardous waste must also be collected from the site by a registered waste carrier. Dangerous waste may also be classed as toxic and must, in this case, adhere to the ‘Carriage of Dangerous Goods’ regulations. Again, full lists can be found on the UK government site but common items that fall under these regulations include asbestos, acids, flammable liquids and clinical waste. Animal By-Product regulations usually apply to waste produced by food manufacturers and/or shops where waste includes raw meat or eggs. The regulations require that this waste is collected separately from other waste and is processed by composting, rendering or incineration. On-site processing of waste may be possible for some businesses in this category and environmental permits will be required for any waste treatment processes carried out on site. In some cases, low risk operations may be exempted but it is important to check with the Environment Agency before undertaking any processing of waste at your own premises. Any waste collected from your business premises must be collected by a Registered Waste Carrier. You can confirm that your contractor is registered online by visiting the ‘Public Register of Waste Carriers, Brokers and Dealers’ available on the Environment Agency website. Many small businesses may also be required to register with the environment agency if waste management, or disposal, forms part of their operations. The following businesses are likely to fall under this requirement. Full details can be found on the Environment agency and UK government sites as well as national government sites for devolved administrations. Registering can be done online and should be completed through the relevant agency, depending on which part of the UK your business operates in. Waste can be sorted and recyclable material removed on site. Your contractor will then collect the pre-treated waste for separate disposal. Contractors can collect mixed waste and process this at a registered sorting facility to extract material for recycling. If you produce waste that can be processed by incineration, or at an Energy from Waste site, you may be exempt from the requirement to pre-treat. Check with the Environment Agency or your contractor to confirm if this applies. A Waste Transfer Note (WTN) is a document that ensures waste is transferred from person to person safely and legally. This is part of your businesses responsibility to ensure you deal with waste without harming the environment – known as your duty of care. Before any waste can be collected, all waste must be identified on a WTN. This will require a written description of the waste or, at the minimum, an EWC code for all waste to be collected. The full list of codes can be found on the UK government site and the codes will help you to correctly identify and dispose of the waste that you produce. The codes also identify waste that is classified as ‘Hazardous’ and this waste must be disposed of separately from general waste. Further information on Waste Disposal and management can be found on the UK government site, the Environment Agency site and the websites of the devolved administrations. Your contractor should also be able to supply more information, advice and support to ensure that your business stays within the law! Let Expert Market hep you get a quick, tailored quote for your commercial waste disposal. Simply fill in this short form to get yours.